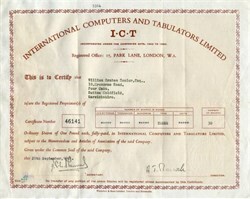 Beautiful certificate from the International Computers and Tabulators Limited issued in 1961. This historic document was printed by the Waterlow & Sons Limited and has an ornate border around it with a vignette of the company name. This item has the printed signatures of the Company’s President, and Secretary, and is over 52 years old. In 1959, recognizing the need to combine forces to compete with IBM, BTM and Powers-Samas merged as International Computers and Tabulators, Ltd. (ICT), the immediate predecessor of ICL. ICT was initially a disappointment, however, with revenues increasing at only 15 percent per year instead of the expected 30 percent. Neglecting to anticipate the speed with which computers would take over from tabulators, the company expended too much effort on tabulators, and its computers were not as profitable as anticipated. ICT's computers were estimated to be two to three years behind IBM's; in particular, ICT was slow to introduce random-access storage, which allows data to be read in any order that a process requires instead of serially, as from a magnetic tape. In the early 1960s, ICT made several acquisitions of other companies' computer divisions, including those of GEC, EMI, and Ferranti. It also resold computers from other companies, including RCA and Univac. When IBM introduced the System/360 range in 1964, ICT concentrated on developing a Ferranti machine, the FP6000, in response. ICT's FP6000 became the 1900 series, launched to great acclaim in September 1964. The machines, which could be delivered within six months of order, established ICT as a major computer supplier, and thousands of the 1900 series had been sold by 1968. Despite technical problems with imported equipment and, in particular, with software development, which proved more difficult and more expensive than anticipated (programmers being scarce during the 1960s), the machines were reliable. However, research and development costs of the 1900 series, together with the steep decline in tabulator revenues, placed ICT in a perilous financial condition by 1965. Government investigations revealed that ICT's management had failed to keep financial control over the company, and a restructuring of management was called for. In six months, the new chairman, Cecil Mead, and managing director Basil de Ferranti succeeded in rescuing the company, improving both its product range--especially by introducing integrated circuits to the 1900 series--and marketing techniques--by placing a much greater focus on the public sector and industries in which ICT had advantages over IBM. During this time, three significant computer companies emerged in the United Kingdom: English Electric, Elliott-Automation, and ICT. In 1967, English Electric bought Elliott-Automation, and the following year English Electric merged with ICT to form International Computers, Ltd.. This deal was masterminded by ICT chairman Terence Maxwell. ICL was controlled by a holding company in which the former ICT shareholders received just over half the shares, the remainder being divided among English Electric, Plessey, and the government. As the largest computer manufacturer outside the United States, ICL had correspondingly large problems to contend with, notably the rationalization of 'the largest range of incompatible computers in the world,' as one director described it. Management decided to continue to develop the 1900 series and also English Electric's System 4, which had superior capabilities for real-time processing--processing in which the computer has to keep up with events in the real world, for instance in air traffic control. ICL also continued to manufacture the Elliott 4100, and, most importantly, embarked on the development of a new range for the 1970s. These projects resulted in huge research and development costs, and the company's financial situation worsened during the recession of 1970-71. IBM responded to the recession by introducing new machines and launching a price war, which ICL could ill afford to join. The troubled company, which had unofficial preferred-supplier status in the public sector, pleaded for more government orders. A government enquiry into ICL began but was interrupted by the 1970 election that returned Edward Heath's Conservative government to power. In the wake of damaging press commentary on ICL's management, the company fired its chairman, Sir John Wall, and managing director Arthur Humphreys (a pivotal figure in large part responsible for the success of the 1900). Tom Hudson, formerly managing director of IBM (U.K.), and Geoff Cross of Sperry Rand were appointed to the positions. During the next five years, Cross transformed the company, introducing up-to-date employment practices such as performance evaluations and incentive plans, and making all senior managers financially accountable within a less centralized management structure. Cross secured from the government a modest extra 'launching aid' grant of £14.2 million toward the new range system. The government later provided £25.8 million in launching aid, and ICL introduced its new range in October 1974. The job of bringing the range to market strained ICL. There were development delays, mostly due to software problems, with hardware problems also occurring as ICL struggled to keep up with quickly evolving semiconductor technology in order to ensure that it was not launching obsolete products. In 1976, ICL acquired the Business Machine arm of sewing machine manufacturer Singer, which gave ICL a presence in the small business system market dominated by IBM. Despite the tumult, Cross achieved spectacular financial results in five years, more than doubling revenues and increasing exports from one-third of revenue at the beginning of his tenure to more than one-half. This achievement earned ICL the Queen's Award for Export Achievement in 1976. However, further technical problems arose, causing the new range to fall behind its development program, particularly in the area of adding network capability, a major concern for purchasers by the late 1970s. Intent on competing with IBM on its own terms rather than entering the market for plug-compatible, or 'IBM-like,' mainframes, ICL had to spend large amounts of money on research and development, particularly on the features that gave it advantages over IBM--most notably the Content-Addressable File Store (CAFS), a device for rapid searching of disc data. Despite outstanding financial results in 1979, ICL found itself in trouble following the introduction of the IBM 4300 and the unfavorable turn in exchange rates. By the end of 1981 ICL had racked up a loss of £18.7 million for the year. At this time, another new management team was introduced, with Sir Christophor Laidlaw as chairman and Robb Wilmot, formerly of Texas Instruments, as managing director. Wilmot was able to overhaul ICL's research and development strategy swiftly. Realizing that ICL was inferior to IBM in the area of semiconductor technology and that Fujitsu's semiconductor technology was among the best in the world, Wilmot negotiated an agreement with the Japanese company: Fujitsu would manufacture certain semiconductors that were designed in the United Kingdom by ICL for ICL's mainframe computers. This was the first of a series of dealings between the two companies that led to Fujitsu's purchase of a majority share in ICL in 1990. Wilmot also introduced the Networked Product Line (NPL) to make up for ICL's shortfall in the area of communications and distributing processing. The first products targeted such office applications as word processing, and there were relaunches of two existing computers, which would form the foundation for important new ranges: the System 10 with added communications facilities became the System 25, able to link to either IBM or ICL mainframes; and the 7500/1500 computer became the Distributed Resource System (DRS) 20. Under Wilmot, ICL's image and organization were revitalized. The work force was reduced by a third, quality improvement concepts were introduced, and an advertising campaign promoting ICL as 'total systems supplier' was launched. With Laidlaw's restructuring of the balance sheet and reduction of debt, ICL rebounded from its 1981 loss and maintained a sound business footing in subsequent years. Shortly after Laidlaw's retirement in 1984, ICL was purchased by Standard Telephones and Cables (STC), an independent telecommunications company in the United Kingdom. Peter Bonfield, who joined ICL at the same time as Robb Wilmot, also from Texas Instruments, succeeded Wilmot as managing director. Wilmot served as chairman for one year, and in 1985 Bonfield succeeded him. Although it was hoped that the STC deal would lead to a 'convergence' of the two vital technologies of computing and telecommunications, the promised synergies did not materialize to any great extent. Some observers believed that the two companies had irreconcilable views of the marketplace. Under Bonfield's leadership, ICL began producing IBM PC compatibles in October 1988 when it launched the Model 30. The company quickly established a strong position as a manufacturor of PCs, particularly with its powerful 486 computers, which accounted for almost two-thirds of PC sales prior to the purchase of Nokia Data in 1991. ICL entered the 1990s benefiting from a strong position in the market for computers running under the Unix operating system. Once seen as largely appropriate for technical and scientific applications, the Unix operating system gained ground in the commercial world as well since it was an open system that allowed the same software to run virtually unchanged on a large number of different platforms. ICL consolidated this position by launching competitive new Unix systems such as the DRS 6000 range, reportedly the top-selling Unix machines in Britain in 1990. That year Fujitsu bought an 80 percent share in ICL for £734 million; the other 20 percent was retained by STC, now owned by the Canadian company Northern Telecom. As a result of this purchase, Fujitsu overtook Digital Equipment Corporation to become the second largest computer company in the world. Fujitsu announced that it would float 25 percent or more of ICL's shares within five years of the takeover. The remaining 20 percent of ICL continues to be owned by Northern Telecom. This will decrease when ICL is refloated. Experiencing less intervention from Fujitsu than it had from STC, ICL manages its own daily affairs while Fujitsu concentrates on high-level strategy, reportedly with the goal of ousting IBM from its number one position. By the early 1990s ICL reportedly had one of the highest returns on capital of any company in the information technology industry. Fujitsu favored ICL's purchase of Nokia Data, the computing division of the Finnish corporation Nokia, for £230 million in 1991. This purchase, officially a merger, established ICL as the fourth largest information technology company in Europe. Although Nokia Data had been unprofitable, it was strong on personal computing and PC local area networks, and its product range complemented that of ICL, whose traditional strength had been in the mainframe market. The purchase of Nokia Data increased ICL's overseas customer base, particularly in Scandinavia and Germany. ICL also built up its strength in software and services; by 1991 this profitable area accounted for about the same amount of revenue as hardware--50% of turnover--and ICL could claim the number one position in Britain's market for computer services. Also in 1991, ICL established Sorbus, a joint services venture with Bell Atlantic, with operating companies in the United Kingdom, France, Germany, and Italy. With its strengths in Unix, PCs, and services, ICL was well placed to survive the predicted decline in mainframe computers, once ICL's stock-in-trade. ICL has operated continuously in Eastern Europe since the early 1960s and established its Moscow bureau in 1968. The company enlarged its presence in the region during the late 1980s, partaking in a joint venture with Marine Computer Systems to assemble PCs in St. Petersburg. In July of 1991 ICL announced that it was opening a second joint venture in the former Soviet Union, ICL-KMECS in Tatarstan, for assembling its DRS 6000 and DRS 3000 computers. CF Europe, Ltd.; CFM Group, Ltd. (75%); ICL (UK), Ltd.; International Network Services, Ltd. (50%); Omnia ICL, Ltd. (85%); Sorbus Europe, Ltd. (51%); ICL, Inc. (U.S.); ICL (France) International Computers SA (99.9%); Fujitsu-ICL Systems, Inc. (80%); ICL Deutschland International Computers GmbH (Germany); ICL Data A/S (Denmark; 84%); ICL Systems AB (Sweden); ICL Data AS (Norway); ICL Computers AS (Norway); ICL Nederland BV (Netherlands); Sorbus Europe BV (Netherlands; 51%); and many others worldwide. 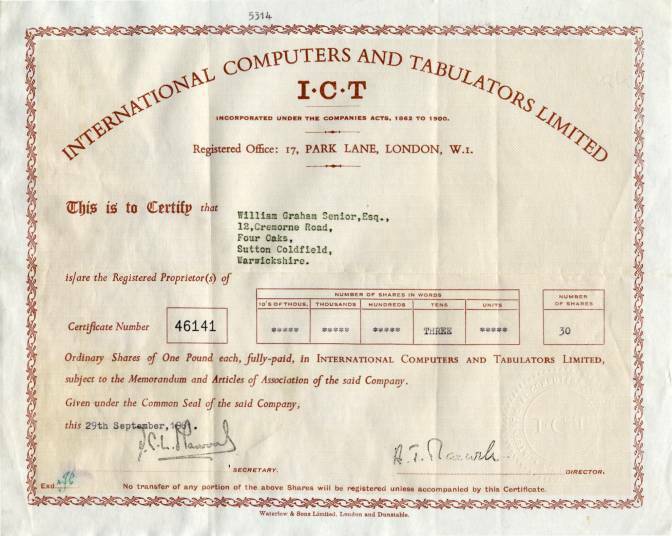 International Computers and Tabulators (ICT) was formed in 1959 by a merger of the British Tabulating Machine Company (BTM) and Powers-Samas. International Computers and Tabulators or ICT was formed in 1959 by a merger of the British Tabulating Machine Company (BTM) and Powers-Samas. In 1963 it also added the business computer divisions of Ferranti. It exported computers to many countries around the world and went on to become part of International Computers Limited (ICL). The ICT 1101 was known as the EMIDEC 1100 computer before the acquisition of the EMI Computing Services Division who designed and produced it. The ICT 1201 computer used thermionic valve technology and its main memory was drum storage. Input was from 80-column punched cards and output was to 80-column cards and a printer. Before the merger, under BTM, this had been known as the HEC4 (Hollerith Electronic Computer, fourth version). The drum memory held 1K of 40-bit words. The computer was programmed using binary machine code instructions. When programming the 1201, the machine code instructions were not sequential but were spaced to allow for the drum's rotation. This ensured the next instruction was passing under the drum's read heads just as the current instruction had been executed. The ICT 1301, and its smaller cousin the ICT 1300, used germanium transistors and core memory. Backing store was magnetic drum, and optionally one-inch-, half-inch- or quarter-inch-wide magnetic tape. Input was from 80-column punched cards and optionally 160-column punched cards and punched paper tape. Output was to 80-column punched cards, printer and optionally to punched paper tape. The first customer delivery was in 1962, a 1301 sold to the University of London. One of their main attractions was that they performed British currency calculations (pounds, shillings and pence) in hardware. They also had the advantage of programmers not having to learn binary or octal arithmetic as the instruction set was pure decimal and the arithmetic unit had no binary mode, only decimal or pounds, shillings and pence. Its clock ran at 1 MHz. The London University machine still exists (January 2006) and is being reinstated to working condition by a group of enthusiasts. The ICT 1302 used similar technology to the 1300/1301 but was a multiprogramming system capable of running three programs in addition to the Executive. It also used the 'Standard Interface' for the connection of peripherals allowing much more flexibility in peripheral configuration. The 'Standard Interface' was originally prototyped on the 1301 and went on to be used on the 1900 series. The ICT 1500 series was a design bought in from the RCA Corporation, who called it the RCA 301. RCA also sold the design to Siemens in Germany and Compagnie des Machines Bull in France who called it the Gamma 30. It used a 6 bit byte and had core stores of 10,000, 20,000 or 40,000 bytes. The ICT 1900 series was devised after the acquisition of Ferranti's assets which brought in the new Ferranti-Packard 6000 machine from Ferranti's Canadian subsidiary, which was considerably more advanced than the existing 130x line. It was decided to adapt this machine to use the 'Standard Interface', and it was put on the market as the ICT 1904, the first in a range of upward-compatible computer systems. In 1968 ICT merged with English Electric Computers, itself formed from the prior mergers of English Electric Leo Marconi (EELM) and Elliott Automation. The resulting company became International Computers Limited (ICL). At the time of the merger English Electric Computers was in the process of making a line of large IBM System/360-compatible mainframes based on the RCA Spectra 70, which was sold as the ICL System-4. Both 1900 and System-4 were eventually replaced by the ICL 2900 Series which was introduced in 1974.